Mixing or malaxation for 20 to 40 minutes allows small oil droplets to combine into bigger ones which can be removed in the next step. It is an absolutely necessary step. The paste is often heated to 28 degrees centigrade during this process. The most common mixer is a horizontal trough with spiral mixing blades. Longer mixing times increase oil yield and help the oil pick up minor components which can improve flavor. 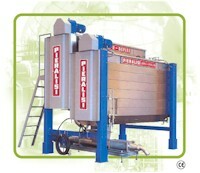 But longer mixing allows oxidation which decreases shelf life. The new Pieralisi "Genius" system uses closed mixing chambers which are filled with inert gas during the mixing cycle, thereby allowing increased yield and flavor without the danger of oxidation. With longer mixing, there are the advantages of a better yield and oil picks up minor chemical constituents. The disadvantages of longer mixing are more oxidation, shorter shelf life, higher acidity and peroxides.